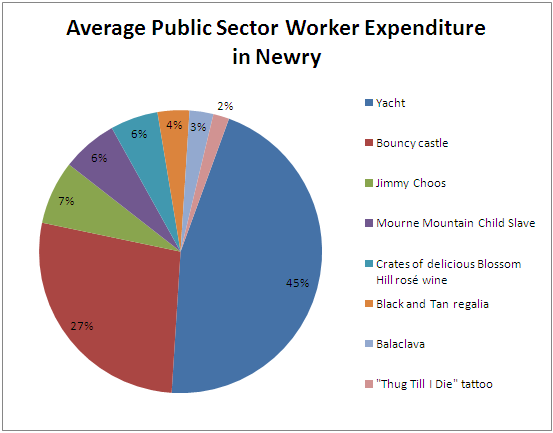 Studies suggest that the average striking public sector worker went to Newry today. But what did she do when she got there? 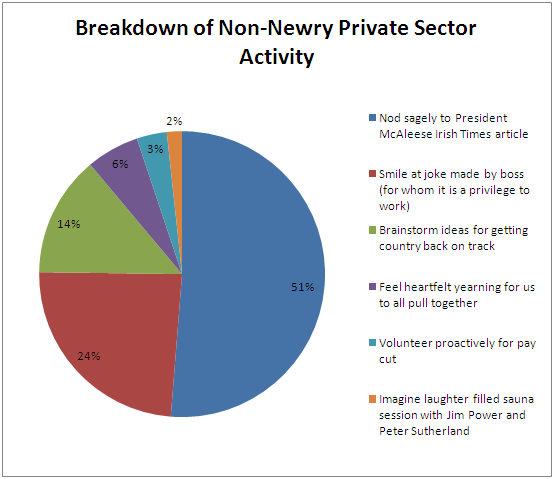 I have been given the data from Newry’s business community. Now to get to grips with the significance of this data, we have to get a measure of what was going on at the same time in the private sector, while the average striking public sector worker was up in Newry, or stuck in traffic with all the other average public sector workers. Unfortunately we don’t have any expenditure figures, since the average private sector worker cannot afford to take a day off since the country would collapse and besides he has no money. However we do have the results of a survey conducted in which we asked the average private sector worker what he got up to on his work break, since data on what he might get up to while working would be unreliable, given the well-known propensity of the private sector worker to have his mind focused on his work. Therefore whilst what follows is by no means an apples-to-apples comparison, we are confident that it does give an insight into the differing experience of the average private sector worker. We shall leave it to others to draw the conclusions. Update: honest to Jehovah, I had no idea this story was on the way when I wrote the above last night. THE VAST majority (72 per cent) of people want to see a reduction in the number of non-Irish immigrants living here, according to an Irish Times /Behaviour Attitudes opinion poll. Overall, a total of 43 per cent say they would like to see some, but not all, immigrants leave the State, while 29 per cent would like to see most immigrants leave. In contrast, just over a quarter (26 per cent) would like to see the number of immigrants remain as it is. In a reversal of trends from polls in recent years, younger people’s attitudes towards immigration have hardened the most. These media coups are symbolic coups de force that are struck in all innocence, and all the more effective for being unconscious. There is a sense in which this can only be done because the people who practise this violence are themselves victims of the violence that they practise, and this is where we get the false science of the half-educated that likes to give the appearance of scientific ratification to the intuitions of common sense: typologies based on projecting the social unconscious of those who commission such things (businessmen or politicians) and those who receive their commissions (journalists). And the responsibility of journalists comes from their involvement in this circulation of unconscious material. Among the most powerful tacit propositions are all those that bear on those oppositions, that are principles of vision and division, such as rich/poor, bourgeois/common people, on which the struggle of the workers’ movement was based and which are still present in the unconscious of the majority of us; but also today, oppositions like nationals/foreigners, indigenous/immigrants, us/them, etc. This is a tremendous change. People might take completely different positions on what should be done about immigrants, but even those with opposing view tacitly agree – consensus within dissent – that the opposition between indigenous and immigrants has predominance and priority over every other kind of opposition, starting with that between rich and poor – within which there can of course also be indigenous and foreigners. This realizes the dream of all bourgeoisies, to have a bourgeoisie without a proletariat. From the point that there are only nationals, rich and poor together, everything is well sorted out, at least for the rich. -From Questions of Words, The Media In The Service of Conservative Revolution, Political Interventions, Verso. When did Ireland last produce a striker who was in the top five scorers in the English first division or Premiership? The Toyota Way (the 14 management principles of the car manufacturer) offers similar advice with the Five Whys model (which aims to assist in getting speedily to the roots of problems), emphasising that the obvious answers are rarely deep enough. Few systems are more complex than a liberal, market-oriented democracy. How society works is complicated, which is why some feel the need to employ methods first used to sharpen industrial production techniques as a means of putting society along the right track. Not a new idea: Lenin, for instance, having previously recognised Taylorism as an instrument for the further exploitation of the workers, man’s enslavement by the machine, went on to ‘raise the question of applying much of what is scientific and progressive in the Taylor system‘. Its application would take place in service of the transition from capitalism to socialism, with Lenin’s form of socialism envisaging competition on a broad economic basis, with competition organised between communes. But whereas Lenin ostensibly claimed to envisage Taylorism as an instrument for the ‘organisational form of the dictatorship of the proletariat’, leaving behind the ‘formal democracy of the bourgeois republic’ to ‘real participation of the mass of working people in administration’ (and we can leave to one side the matter of how successful this was), the use of modern management principles in Casey’s article is adduced as a starting point for the maintenance of a ‘liberal, market-orientated democracy’, id est, the formal democracy of the bourgeois republic. Another common name for this is capitalism. Something incredible has happened to our national value system in the course of a single generation. Family, education, work and self-sacrifice defined our parents. The defining value of Ireland 2009 is self-interest. This is an almost impossible shift in such a short time. The only plausible explanation I can offer is that the omnipresent and suffocating nature of the social partnership process has coded us to think only of ourselves. Having started out apparently concerned with the highly complex system of liberal, market-oriented democracy, he seems to have been waylaid into a confrontation with something called the ‘national value system’. A naive and sympathetic close reader might regard this as unfortunate. First, because there has not been much talk of the ‘national value system’ (Casey’s article is on the first page of Google search results for the term), and even if it does exist in reality, there’s no reason to assume that its existence is not determined by the broader political and economic system. Indeed, if we substitute ‘capitalism’ for ‘liberal, market-oriented democracy’, we might find a more convincing explanation than social partnership as to why the ‘defining value’ of Ireland in 2009 is self-interest, since self-interest is well-known as a defining characteristic of capitalism. You know the capitalist love story: a merchant invests in a industry not because they care much about the good of the society in which the industry exists but because they want to make a profit, and in doing so they are guided by ‘an invisible hand to promote an end that is no part of his intention’, i.e. greater material wealth for the wider population. That’s how it’s supposed to work anyway. One problem with this, from the point of view of the merchants at least, is that people compelled to work in industry for a wage will, no doubt out of some degree of self-interest, seek to maximise their wages and improve their general working conditions, and not entirely without good reason. The ideas of the ruling class are in every epoch the ruling ideas, i.e. the class which is the ruling material force of society, is at the same time its ruling intellectual force. The class which has the means of material production at its disposal, has control at the same time over the means of mental production, so that thereby, generally speaking, the ideas of those who lack the means of mental production are subject to it. The ruling ideas are nothing more than the ideal expression of the dominant material relationships, the dominant material relationships grasped as ideas; hence of the relationships which make the one class the ruling one, therefore, the ideas of its dominance. One curious and interesting thing about Casey’s article, then, is that he profers a pseudo-Marxist explanation for the current situation -the ruling material force of society, which is to say, social partnership, is its ruling intellectual force, and therefore the ‘self-interest’ that pervades the ‘national value system’ is what enables social partnership to dominate. This may strike you -as it does me- as bonkers on rocket-powered rollerskates, but this explanation is, in reality, an expression of the ideas of ruling class dominance, brought to you by the Irish Times. Confronted with the likes of this, Thierry Henry has done Irish people a favour. Can you imagine the outpourings of ‘if the footballers can do it, then so can we!’ voluntarist exhortations that would gush forth from every media outlet for months on end? We do not need to say what lessons this team teach us. It goes beyond saying. It’s about love and bonding and fortitude and losing your petty concerns for a bigger ideal that others share too. And when our friends in Britain, the States, Australia, wherever, text us to wonder if the dream is real , we can say ‘Yes’. Yes, we wuz robbed, yes we feel crushed but yes, they have proved we can do it. To which one can only ask: do what? To rank the incident in Paris alongside Diego Maradona’s “Hand of God” in 1986 is misleading. That was a street kid’s instinct, acclaimed by his compatriots as revenge for Antonio Rattín and the Malvinas. Henry may come from Les Ulis, a quartier difficile outside Paris, but he is a sophisticated man, and a much decorated one. A chevalier of the Legion d’Honneur should have done better – by his opponents, by himself, and by the game. So what’s the story, people from ‘quartiers difficiles‘ can’t be expected to be as sophisticated as your average Guardian columnist? And what of the appeal to the standards of Legion d’Honneur members? It says on Wikipedia that David Petraeus, Shimon Peres and Vladimir Putin are members. Maybe Henry should bomb some civilians in order to redeem himself. I’ll come now to what bugs me. Governments must be held to account. Yet, I sometimes rail against the blanket intolerance that you sometimes see. Here is an example. There are two ways of looking at Brian Lenihan’s little row with AIB this week. He put his foot down and inisted that Colm Doherty’s salary was limited at €500,000. Or he ceded to the bank by allowing it to pick its own man for the job. Biased assimilation came into play here. It’s the intellectual laziness of choosing the argument that happens to fit your own argument. I don’t care much for the accusation of intellectual laziness, since many complex but bogus arguments are the product of intense intellectual application. It does not help the argument on display here that the accusation of biased assimilation is introduced via the assertion that ‘there are two ways of looking at Brian Lenihan’s little row with AIB’, since it does not require much effort to realise that there are more than two ways of looking at the situation. But by declaring arbitrarily that there are only two ways, you can narrow things to fit the terms of your own argument. Nonetheless, the point made in the comment that there is ‘moral shrillness’ in journalism, particularly in relation to politician expenses, seems sound enough to me, though I have no idea what ‘intolerance’ means in this regard. But there are very good reasons for journalists to produce morally shrill pieces on political expenses. One is that politician expenses are a relatively cheap source data by comparison with expenses accumulated in the private sector. If top executives are gorging themselves sick in top restaurants using their expense accounts whilst simultaneously cutting worker wages and funding lobby groups to advocate wage cutting (and I happen to know for a fact that this happens), news journalists are unlikely to get round to reporting on this because a) the cost of reporting on such a matter is too high relative to reporting on information provided on request by the state; b) news outlets have no incentive to investigate anything other than the most egregious instances of such behaviour, since to do otherwise would hit the appeal of the outlet to potential advertisers, and even in cases where such behaviour comes to light, it would tend to be on account of involvement of some politician or other, and would be therefore effectively subsidised by the state; c) media reproduces the interests of its owners, among which one might find an interest in representing government as evil by contrast with virtuous and dynamic private enterprise, and a denial of the existence of class conflict, except in the grotesque form of corrupt politicians and their cronies the faceless bureaucrats versus the common man who only seeks to earn an honest crust.